This project (formerly For All the World to Hear: Stories from the Struggle for Civil Rights) organized by the Center for Art, Design & Visual Culture, UMBC, is a dynamic humanities project in which approximately 10 senior adults from the Baltimore area tell, write, perform, and digitally publish personal stories of their involvement in the struggle for civil rights. Click below to view their digital stories. The first part of the project brought senior citizens from inter-racial and inter-faith backgrounds together for a series of oral history interview meetings. 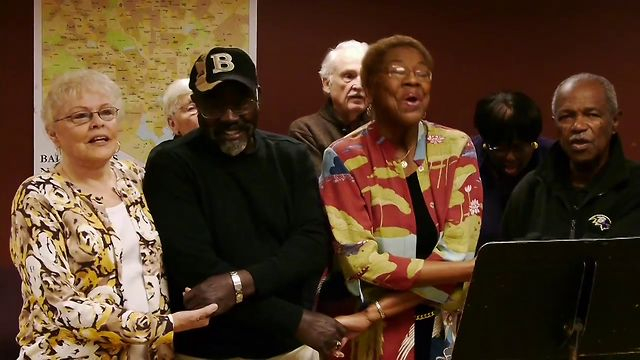 With guidance from oral historian, dramaturg, and performance director, Harriet Lynn, their written accounts resulted in a lively program delivered before diverse audiences in the Baltimore area. Following each live performance there were mediated, interactive audience discussions. Performances were held at sites including museums, libraries, and college campuses. Additionally, CADVC’s long-standing K-12 educational outreach program activated connections with schools in proximity to performances resulting in a rich, first person history lesson for Baltimore area school children. The second half of the program involved the same group of seniors with the Center’s ongoing digital publishing initiative through a unique digital storytelling component. Each senior partnered with a UMBC student to realize his or her story in digital video format, which ultimately is published here an on on CADVC’s YouTube and CADVC’s Vimeo page, where you can also see the full, live program of Stories from the Struggle. This project was a community outreach program of the Center for Art, Design & Visual Culture, UMBC. It was organized by Sandra Abbott, CADVC’s curator of collections and outreach in collaboration with Harriet Lynn, producer/artistic director of Heritage Theatre Artists’ Consortium. The program was supported in part by the Maryland Humanities Council. Program partners included the St. Francis Neighborhood Center, Stoop Storytelling Series, Howard Peters Rawlings Conservatory & Botanic Gardens, Druid Hill Park and the Senior Citizen Division of Baltimore City Recreation and Parks. Media partners included The Beacon Newspaper and WYPR. The Center for Art, Design and Visual Culture is a non-profit organization dedicated to organizing comprehensive exhibitions, the publication of catalogs, CDs, DVDs, and books on the arts, and educational and community outreach projects.